Movies Like The Fault In Our Stars: Romantic Dramas '+g+"
The Fault in Our Stars is a 2014 romantic drama directed by Josh Boone, based on the novel by John Green with the same name. 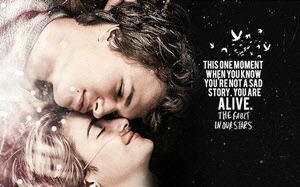 The movie follows Hazel (Shailene Woodley), a 16-year-old cancer patient who meets Gus (Ansel Elgort) at the cancer support group and falls in love with him and they experience the true meaning to be alive. If you like watching movies like The Fault In Our Stars (2014) and looking for more movies similar to it? then check out the below list of recommendations and don't forget to mention if we miss any as we keep on updating this list. My Sister's Keeper is a 2009 drama based on the book by Jodi Picoult with the same name and directed by Nick Cassavetes. The movie tells the story of Anna Fitzgerald (Abigail Breslin) a 11-year-old girl conceived by means of in vitro fertilization to be a donor for her older sister (suffering from acute promyelocytic leukemia) and now seeks medical emancipation from her parents and demands the rights to her own body. Now Is Good is a teen drama movie directed by Ol Parker based on Jenny Downham's novel 'Before I Die'. The story follows Tessa Scott (Dakota Fanning) a seventeen year old passionate girl who has been diagnosed with leukemia. She is determined to enjoy her life to the fullest by preparing a list of desires to do before dying which includes losing her virginity, taking drugs and more. The Perks of Being a Wallflower is an 2012 coming of age comedy drama based on Stephen Chbosky's best selling novel with the same name.The plot revolves around Charlie (Logan Lerman) a lonely and nervous freshman befriends a pair of charismatic seniors, Sam (Emma Watson) and her fearless stepbrother Patrick (Ezra Miller) who welcome him to the real world. The Spectacular Now is a 2013 romantic comedy-drama based on the book by Tim Tharp with the same name and directed by James Ponsoldt. The movie follows Sutter Keely (Miles Teller), a sociable charming and self-possessed high school senior whose life changes when he meets with his not so popular classmate Aimee Finecky (Shailene Woodley). A Walk to Remember is a 2002 teen romantic drama based on the book by Nicholas Sparks with the same name. The story follows popular rebellious high school student Landon Carter (Shane West) whose prank on a fellow student leaves him paralyzed is sentenced with community service where he falls in love with Jamie Sullivan (Mandy Moore) the town minister's (Peter Coyote) daughter. Hachi: A Dog's Tale (2009),....if you can think of more, then don't forget to mention it in comments.